If you feel you need some initial guidance on how to use inhaled medications, you should ask for help at your veterinarian’s office. As you probably have already experienced first hand, cats can be tricky to medicate. Veterinarians know that it is difficult for many owners to medicate a cat consistently with a medication that is required twice daily, and almost impossible to administer a medication reliably and unfailingly three times daily. Therefore, most veterinarians aim for a balance between efficacy and ease of administration, prescribing the most effective drug that can be given with the least frequency. Medications that come in pill or capsule form are especially challenging because most cats actively resist having pills put down their throats. Uniquely designed treats — such as “Pill Pockets” — are available in some pet stores and veterinary offices. These are soft treats with a hole cut out of the center. Pills are placed in the center of the treat, and are then sealed inside by gently squeezing the sides. Some cats can be tricked into taking pills this way for months, although many catch on to the ruse and will eventually refuse to eat the treat. Cat owners often find liquid medications easier to administer. Fortunately, a number of pharmacies now offer compounding services: They can convert medications traditionally available only in capsule or tablet form into other formulations, such as a liquid form, often adding chicken, liver, beef and tuna flavoring if requested. While most cats do not like having any medication forced upon them, many find a tuna- or chicken-flavored liquid less objectionable — and a few will even take a flavored medication voluntarily. However, there remains a number of pill-hating cats who will also resist liquid medication, regardless of the flavor. Transdermal medication (delivering drugs into the bloodstream via application of gels or skin patches) offers another option of medicating cats that simply refuse to take any medication orally. Some medications can be compounded into a gel, a small amount of which can be spread on the inner surface of the ear. The medication is then absorbed through the skin, into the bloodstream, allowing owners of stubborn cats to bypass their mouths completely. While transdermal drug administration is becoming more commonplace in veterinary medicine, there are only a few drugs for which efficacy has been proven with this method. Just because a drug can be formulated into a transdermal gel doesn’t mean that therapeutic blood levels of the drug can effectively be achieved. 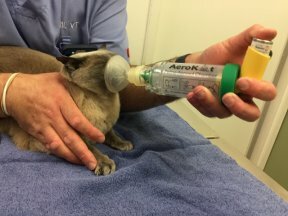 Inhaled medications present another option for medicating cats, but the use of inhaled medications is limited to cats with respiratory ailments, most notably asthma. Interestingly, veterinarians seldom prescribe inhaled medications because of the difficulty of administering oral medications to a cat. Rather, inhaled medications are often given because of the reduced risk of side effects when using inhaled medications. (Photo courtesy of Aerokat). The most popular device for inhaled medications in cats is the Aerokat. Asthma is the most common reason for prescribing inhaled medication in cats. The most effective long-term treatment consists of high doses of oral steroids. Steroids attenuate the inflammatory response, reducing the severity of signs. Steroids are given twice daily for several days. Most newly-diagnosed asthmatic cats will feel and act much better — at which point, the steroid dose is tapered slowly over several weeks. Unlike dogs, cats are fairly resistant to the undesirable side effects of steroids. A few cats, however, exhibit adverse effects from steroids, making treatment challenging. Oral steroids cause water retention, which increases a cat’s blood volume. Because of this, cats with heart disease may not be able to withstand the increase in blood volume, putting a strain on an already compromised heart and triggering congestive heart failure. Oral steroids also oppose the action of insulin, and can cause a well-regulated diabetic to become poorly manageable. Some cats may be pre-diabetic, and giving oral steroids can tip them over the edge into overt diabetes. Inhaled steroids, when administered, exert their effects almost exclusively in the lungs. Very little of the drug crosses beyond the lungs into the bloodstream, so systemic side effects are minimized. Bronchodilators are drugs that reverse airway constriction, allowing the air passages to open. Although most asthmatic cats can be managed with steroids alone, some require a bronchodilator in addition to the steroid. Bronchodilators can be given orally, although an advantage of inhaled bronchodilators is their rapid effect, which may be lifesaving in severely asthmatic cats that are prone to acute asthma attacks. Both types of drugs are available for humans, as metered dose inhalers (MDIs). Human adults quickly learn to coordinate the inhaling of the medication with the actuation (pressing) of the device, although this is much more difficult for children, and impossible for infants or cats. An alternative was developed to allow children, infants and cats to use the MDIs without having to coordinate their breathing. A spacer — a plastic chamber roughly the size of the cardboard inner tube of a roll of toilet paper — is attached to the MDI, and a facemask is attached to the other end. The spacer acts as a temporary storage area for the misted medication to sit, until the individual breathes it in. Cat owners are taught to attach the MDI and the facemask to the spacer, and then to actuate the MDI twice, filling the spacer with the mist. The facemask is gently placed over the cat’s mouth and nose, and the cat is allowed to inhale and exhale seven to 10 times with the mask in place. The most popular device for inhaled medications in cats is the AeroKat. Inhaled steroids are the most potent inhaled anti-inflammatory drugs available. Fluticasone (Flovent®) is the most commonly used inhaled steroid. As for bronchodilators, Albuterol (Proventil® or Ventolin®) is the one most commonly used for asthmatic cats. Caption for photo at top of page: If you feel you need some initial guidance on how to use inhaled medications, you should ask for help at your veterinarian’s office.